There is increasingly a growing trend for people to adopt/rescue dogs from various countries abroad; Romania, Greece, Spain, France and others. Personally I’m not in favour of this because there are thousands of dogs in this country, languishing in rescue centres, desperately needing a forever home. That said, many people do seek dogs from abroad and that’s a decision you’ve probably made already. Often, owners allow their heart rule their head and don’t truly appreciate what they are committing themselves to. They think they are rescuing a dog from a ‘fate worse than death’. Whilst this may sometimes be the case, the dog could have led a perfectly happy life, albeit different to what we think is normal and/or acceptable. Imagine for a moment you are that dog. You are plucked from all that you know and shipped off to a foreign land. You have no idea where you are, the climate, the culture, the food and you don’t know the language. How would you feel if you found yourself in such a situation? Likely as not you would be bewildered, homesick, have difficulty coping and this will cause you great stress. You don’t know at that stage that the people you find yourself with just want to shower you with love and affection, you will want for nothing. Your dog may never have been on a lead. May have lived in the countryside and never encountered traffic. They may have been one of life’s ‘drifters’ travelling wherever life took them. They may have been used to sleeping under the stars and never in a house. Being fed meant that they had to hunt and kill their own food. Used to have lots a ‘canine mates’ to chat and play with in the street. Sometimes they have been physically or mentally abused so gaining trust maybe a long, long process. You will probably never know for certain but the above few reasons need to be considered. Can you see now why they are possibly going to find settling into our way of life very difficult? We expect them to feel ‘grateful’ and to hang on our every word and do everything that we ask of them. Dogs in this situation need us to be extremely patient and give them all the time necessary to acclimatise to our way of life. Don’t rush them off to ‘obedience classes’ where they are very likely to feel overwhelmed. Gently begin to teach them at home; remember that English is unlikely to be their first language. 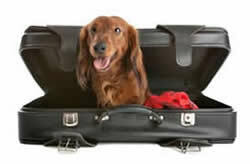 Dogs from abroad can be very rewarding and fulfilling and a fabulous addition to your family. However, love alone is NOT enough! Your dog’s specific needs have to be considered and catered for.